Great question. There are two methods for assessing your fair consultant billing rate, and both are important, the floor and the ceiling. Here’s how to judge your minimum consulting billing rate. This is the rate you must charge in order for you to justify your time and the project you’re working on and is typically expressed in an hourly rate. First, you need to know what your mandatory annual income is, the money you must earn in order to be able to survive and reasonably thrive. As a consultant, there’s a good chance you will be a 1099 consultant as well, so you’ll need to budget between 30-50% extra for health insurance, self-employment tax, etc. Using the calculator above, I set a tax bracket of 25% for federal, 7% for state, and a healthcare cost estimated at 25% of all expenses. 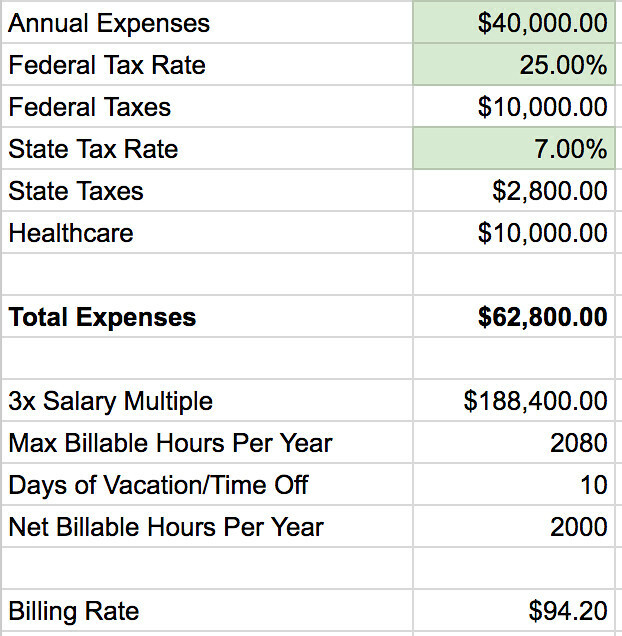 Before anything else, the total income I’d need in this example is $62,800. Now here’s the part almost every consultant does wrong. They assume 100% utilization, meaning every hour they’re clocked into work, they’re doing billable work. That’s far, far, far from the truth. The reality is that consultants are lucky to get 50% utilization. If you’ve ever done business with an agency, the average billing rate is 3x the salary of the person doing the work; that 3x multiple translates into 33% billable time. The other 67% of your time will be spent building your business, marketing yourself, speaking, etc. In the example above, that $62,800 in necessary income is $188,400 in what you must bill in total for the year. Don’t forget things like time off. If you want to take time off – and you should – that must be budgeted as well. In the example above, I removed 80 hours of billable time, or two weeks’ vacation. Want to take more? Remove more billable hours. Once you have your hours and the total amount you must bill, divide the two. Above, in order to meet expenses, grow the business, and take time off, I would need to bill $94.20 per hour in order to sustain a consulting business. This is my floor billing rate, the rate I must not bill under, or else I risk losing money and/or harming my ability to grow the business. Most large consulting agencies follow a similar model, either the 3x rule or maintaining 40% gross margin. For individuals and small boutique consulting firms, I strongly recommend the 3x rule. Don’t accept any project under that rate unless there’s some massive leverage that comes with the project, like the opportunity to move up the food chain somehow. If you’re billing a project with a fixed fee, decide how many hours it will take you to accomplish it, multiply times your hourly rate, and be sure to specify in your contract that the project is restricted to X hours, with additional hourly charges for every hour after that point. The ceiling is where you make the big money, but it’s much harder to judge, much harder to assess without a lot of experience. The ceiling is based on how much your work is worth to your client. For example, let’s say you’ve been asked to speak at a conference and you’re a popular speaker. You know that you can put 50 butts in seats just by telling your fan base that you’ll be there. You know that the conference is charging $495 per ticket. Effectively, your value to the conference is $495 x 50, or $24,750. If you don’t speak, the conference may or may not fill those seats. It’s reasonable, therefore, to ask for a percentage of that ticket fee as your pay. How much should you ask for? Some conferences are offering up to 50% of the ticket price as a commission in their affiliate program, so it’s reasonable to ask for that as your fee outright or in an affiliate program if you’ve got a great audience/community. Think about the contrast between floor and ceiling in this example. If you charged your floor rate of $94.20/hour, even if you billed for an entire day (8 hours) for the conference, you’d only make $753 at your floor billing rate. If you got 50% of ticket under your affiliate program (assuming 50 seats at $495/seat), you’d get $12,375. That’s a gigantic difference, and it’s why you must find your ceiling as quickly as possible. In order to develop a fair ceiling rate, you must know and understand deeply the industries and companies you’re serving so that you know the economic value of the work you’re providing. As another example, say you know a particular method for looking at Google Analytics, a way that can instantly increase the ROI of a company by 30%. If you know the company’s industry and know that 30% more in their digital marketing ROI is worth X, you can justify charging a percentage of X and explaining how your pricing works. In Alan Weiss’ excellent Value-Based Fees book, he recommends a 4:1 ROI fee; for every $4 in new revenue you help a business earn, you keep $1, or 25%. A third example might be a graphic designer whose work increases website conversion from 2% to 5%. What does a 3% increase in conversion mean? Well, if the designer understands the companies they work with, they can say, “you’ll earn more with my design because my methods improve conversion from 2% to 5%, and that’s worth X to your company in additional revenue, thus my fee is 25% of X’s value over the first year my design will be in operation as long as my design hits 5% conversion. After that first year, 100% of the increased value will be profit to you“. That’s the power of ceiling billing rates – it goes far beyond day labor rates because you know what your work is worth, and once you explain that to your clients, you stand a far better chance of earning more. Why? Because you demonstrate understanding of their business and the value you are providing, and you have a performance target built in. If your client reaches 5% website conversion, you get paid a large fee because you created the value they were seeking. Finding your ceiling requires you to ask, ask, ask your customers what the impact of your work will be, and/or asking peers, colleagues, or even competitors what results they’ve generated. There’s no substitute for domain expertise or knowledge in finding your ceiling. Floor billing rates are typically expressed in hours – $50/hour, $500/hour. Ceiling billing rates are typically expressed as percentages of fees or flat budgets. This project will cost $25,000, this work will cost $5,000, etc. You know you’re closer to your ceiling billing rate when you stop quoting hours. Your goal in doing any kind of consulting is to achieve your ceiling billing rate as soon as practical, while never violating the floor rate. That means developing a strong, deep understanding of the value of your work to your clients and moving away from the floor where you’re just another hired hand whose work quality may or may not impact their business. Disclosure: this post was first published in 2012 and has been revised several times since. The most recent revision adds more to ceiling billing rates.